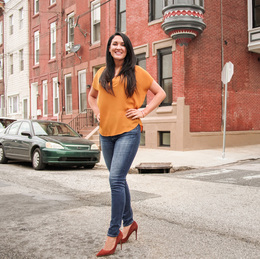 Rachel Street, the star of DIY Network’s Philly Revival makes herself at home. When she’s not designing, renovating, or purchasing properties in Philadelphia, Rachel Street enjoys sharing her toolbox of know-how with homeowners. As the star of her new DIY Network series Philly Revival, Street resuscitates historic homes and shares her expertise along the way. The show follows her as she buys, renovates, and then sells unique homes in the city. Real estate wasn’t Street’s first career choice. She studied to be an opera singer, majoring in music at New York University and Temple University. After living and performing in Italy for three years, she returned to the States and drifted toward a different career. Even so, she still has the heart of a performer. Street began working with her father, who was a commercial mortgage broker. She started with loan underwriting and home appraising, and then attained her real estate license. She then wanted to buy a house to produce some rental income, but she couldn’t afford one that was already renovated. Because she had a knack for using tools—she used to make furniture with her dad, a carpenter—she bought her first house and ended up fixing it up herself. After her father’s unexpected death, Street began working as a Realtor and then started her own construction company. We caught up with Street and asked her to share her thoughts on local real estate trends, mistakes to avoid when taking on a home renovation, and tips to help a homeowner increase a home’s curb appeal. What comes into play when it comes to choosing a property in which to invest? What I tell people when they are investing in a property for the first time is to always invest in an area that you know. You really want to make sure you are doing your research. If you are investing in a property that you want to sell, you should really understand the values in that neighborhood and whether people want to move in or if they are moving out, since all of this goes in phases. 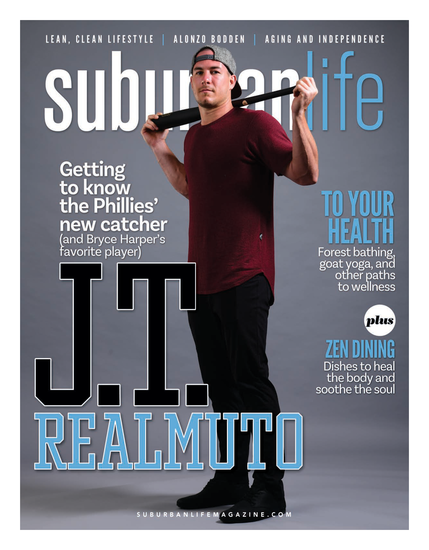 Every year there is a new hot area in Philadelphia, and every year it changes. When it comes to selling a home, what is a common mistake that homeowners make? Not correctly pricing the home to sell from the start. Your home will have the most exposure the first 15 to 20 days on the market. People often want to try for a higher price, like, $50,000 over what it is worth, but that can be a big mistake. It’s really important to check “the comps,” or comparable homes that recently sold in your area, and figure out where it falls for its size and amenities. Price the property correctly from the start and tend to the glaring repairs that need to be done. Make sure everything is in good working order, and that the home or property looks appealing and spacious. Those items include decluttering, no leaks or issues with the plumbing, HVAC and appliances working well, with no exterior issues, like cracks in the brick. If the bathtub needs to be caulked, don’t wait. If there are leaks in the plumbing, take care of it. You don’t want any of this to come up on the home-inspection report, since you will still be required to make the repairs and you could lose the sale. Look at your home with an objective eye. What kind of tips can you offer homeowners so they can avoid renovation mistakes? Know exactly what the bid is and exactly what the contract means. Does the bid include materials? Is there a contingency if something unforeseen comes up? I would make sure that any estimate clarifies all of the details so that they are comparing apples to apples. Get a couple of quotes to make sure that they are getting quoted a reasonable price. Not getting a written agreement that includes a lot of detail is another mistake. It should be more than one page and explain more than, “I’m going to do a job for $10,000.” It needs to have a detailed explanation of the scope of work, with what materials they are using, and what are the finishes involved. The copy of the contractor’s license and insurance should be attached. For major renovation projects, consider getting builder’s risk insurance. For substantial home renovations, this is a sound idea because if something happens to your house during the renovation, your regular homeowner’s insurance might not cover it. Obviously, you’re hoping for the best, but you always want to prepare for the worst-case scenario as well. Is there any key to avoiding unforeseen extra construction costs? Do your research and learn a little bit about what the job is. Look for recommendations from other people for work a contractor has done before. Make sure that you’re choosing a contractor who’s going to do the right thing for your job. Where do you see the local real estate market heading in the near future? I think it is a really exciting time to be in the city because we are experiencing so much growth. For so long, the city was losing population and we were a city in decline, and now the trend is clearly reversed. The city is growing now and a lot of people are moving into the city, so many areas are being revitalized. When you drive around the city, you can see how many roads are being dug up and there is new construction everywhere. This is a really exciting time to be living in Philadelphia and to be part of the growth and revitalization of the entire city. 1. First impressions count. Buyers look at the space and the light, and they want to imagine themselves living in the house, and not focus on the imperfections. 2. Little things mean a lot. Your real estate agent will walk through your home with a different eye, so before you agree to show your home, try to take care of the things that require TLC—the little ones and the big ones. 3. Don’t forget the front of the house. The front is the first thing that house hunters see, so make sure it looks great. The first photo on any listing is the exterior of the property. Flourishing flowers or lush plants help with the feel that the entire house is cared for. If the front door is very attractive, it will make someone look further. 4. Don’t rush to put your home on the market. Sometimes people want to sell their home and get it over and done with, but they overlook the fact that spending a few hundred dollars on repairs can get you more money. Even if there is a small piece of trim that stands out, buyers may ask themselves, “What else is wrong?” Spending that little bit of money up front is worth it. 5. Try lower-cost options to get your home ready to sell. Do a general cleaning and painting. Clean the house—including the carpet—cut the grass, and trim the bushes. When it comes to painting, steer clear of bold colors, which can be distracting for buyers. Light paint colors in gray, white, beige, or even a pale dusty rose, are better choices. 6. Big budgets are not always necessary. The first house I bought had a nice layout with high ceilings, but I had a small renovation budget, so I made some small changes. I had a bland kitchen with very little personality, so I bought cabinets from a big-box store, painted them, and added new hardware. Voilà! It completely transformed the look of the kitchen. 7. Declutter before you put your home on the market. Do a deep purge to free up space. Empty half of what is in your closets, so prospective buyers see plenty of storage space. You want them to imagine where to put their furniture, and not be thinking that the first thing they must do is repaint that problem wall, or worry that there isn’t enough room for their favorite items.